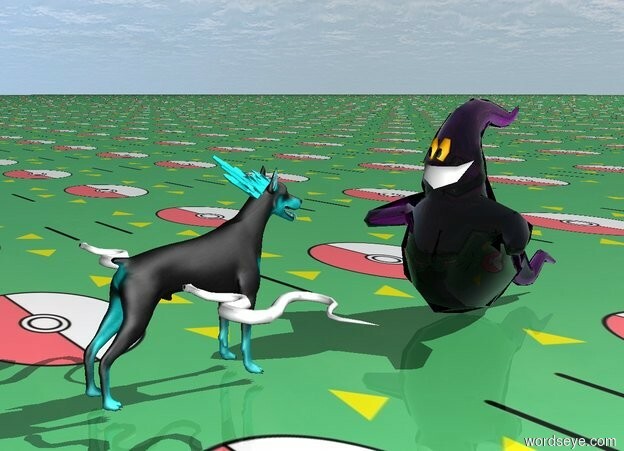 Input text: a cyan dog is facing the purple ghost. the ghost is 3 feet away from the dog. the ghost is facing the dog. the ground is [pokefloor]. the [pokefloor] is 10 feet tall. a 14 inch tall 5 inch wide crystal is -7 inches above the dog. the crystal is -23 inches to the left of the dog. the crystal is leaning 55 degrees to the left. a white snake is 20 inches above the ground in front of the dog. another white snake is 20 inches above the ground behind the dog.